This is an activity you can pull out often, using it as a chance to review any new words they have learned recently, particularly if you have focused on one subject (like astronomy). You could use a “word tray” for this activity, which you should create in advance (click here for an example of a word tray). Better yet, create just such a list with the kids – see instructions for this in the “Make it Happen” step. Lists like these can help students with their work, and creating haiku encourages children to use new vocabulary in context, which helps you to assess their understanding. Print the NASA Inspirations images from this curriculum (See Optional Materials), or show them on a computer, or even projected on a wall. If this is your first time printing these images, keep them – they can be used for a few other activities in this curriculum. You may want to laminate them to keep them in good shape. Printed NASA Inspirations images of planets, the Sun, stars, etc. Haiku always have three lines and 17 syllables. The first line has 5 syllables, the second line has 7, and the third line has 5 syllables again. Traditional haiku has at least one word that refers or hints to the season that you are writing about. Get inspired by the universe and express it through Haiku poetry. Ask your students what they think kids in Japan see when they look up at the sky. What do your students see when they look up at the sky where you live? How does looking up at the sky make them feel? Show children one printed NASA Inspirations images, or show them one of these images on a computer (there are links to even more images listed in “Suggestions”). How would they describe these images? Write down every word the students can come up with to describe the image. Then reveal a second image. Have the students compare the two, and write down all of those words as well. This will give students a collection of words to start with that they came up with themselves. You can also go outside and look up at the sky, or look through a window. Make a list of objects in the sky. What changes when you look in the sky? What stays the same? What words describe what you see? Ask your students to think about how one of the images made them feel, or to think about how they feel when they look up at the sky, and tell them that you would like them to write a haiku based on those feelings. Encourage them to think about all of their senses (see, hear, smell, touch, taste) and write about the sky and any sky-related customs, memories, and imaginations they may have. Ask them to think about any words that come to their mind and to list those on paper. Review the qualities of haiku and encourage your students to create their own poems. After each child has created a poem, gather everyone together in a group. What kinds of feelings did they try to include in their haiku? Is it thought provoking? Is it humorous? Is it peaceful? Is it serious? Does it refer to smell, taste, and other senses? 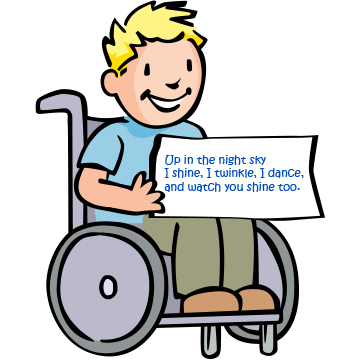 Ask any kids who would like to read their poem to the rest of the group to do so (you might need to write and read your own to get things started). Some afterschools have had a lot of fun organizing dramatic readings of the haikus. Try something like that yourself! After talking about the process, and possibly hearing other haiku, children can go back to their poems and continue working on them, or even write new haiku. Share some more poems after your children have had a chance to create some more. Visit NASA’s website and search for photos and videos that can serve as inspiration for your students’ haiku (https://www.nasa.gov/). You could compare haiku with some popular pop/hip hop/rap lyrics. Explain that musicians are also often poets who try to write and fit verses in their songs – just like haiku. After this activity, try the Sky Haiga activity from this curriculum. Try this activity multiple times throughout the year. Observe the sky on different days and at different times of day. Look at pictures of the sky in different seasons, at different times of day and in different locations. Hold a “Sky Haiku poetry slam” and create an opportunity for students to share and celebrate their haiku expressions. Kids can write and decorate their Sky Haiku on paper, further expressing themselves through visual media. Have a sky haiku performance show and encourage students to add other forms of expression such as dance, music, show & tell, hand claps & feet stomps, etc.